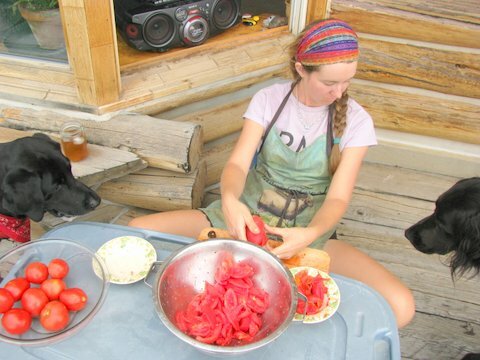 Many times when I receive an email from Gary Entsminger, editor and publisher of Pinyon Publishing in Montrose, Colorado, he’s up to his neck in salsa verde or canning peaches, jams, applesauce, or other home-grown or local fruits or vegetables. His produce is usually fresh from a garden planted and tended by him and his partner, Susan Elliott, a painter and botanist, or comes from farmers in the valley below them. Both Gary and Susan are vegetarians, so when they moved into their cabin, a garden seemed an inevitable ingredient for their lifestyle. Invariably, Gary’s e-mails arrive near supper time, and I find myself salivating over his descriptions of the salsa or sauces he and Susan are brewing in their kitchen. Since Susan is also an herbalist and knows her seasonings, the spices that are part of their recipes remind me of those in Indian and Iranian food. 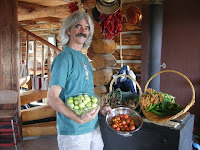 I asked Gary to follow up the garden articles for which Susan supplied the texts on two of my blogs by giving me an interview about producing and canning food at home, and he supplied enough material for two blogs, which I’ll pass on to anyone who’s interested in the hot topic of sustainability. 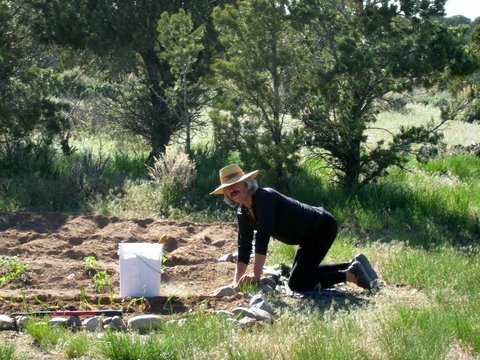 Gary and Susan live in a rustic cabin on the Uncompahgre plateau near Montrose, Colorado year-round and balance their work of publishing books and periodicals/selling rare and second-hand books with hiking, playing musical instruments, growing and canning food. Gary dubbed this piece a “wee spiel,” but he supplies enough information to titillate anyone interested in learning to live “off the land” year-round. Moore: What prompted you to begin growing your own food? Entsminger: That’s a long story. So perhaps I should just describe a problem that American consumers have when it comes to food – 1) grow and preserve food themselves, or 2) buy from someone else. Often, the buying means from a supermarket (or a restaurant). It’s probable that any food bought in a supermarket has traveled a long distance. Some estimate that the average tomato travels 1000 miles to get to a consumer. Since most food in supermarkets comes from California, Florida, Mexico, or further (e.g., many apples come from New Zealand) and especially in winter, the 1000 miles sounds accurate enough, and transporting food is expensive. Also foods harvested for transportation are usually picked earlier and are sometimes genetically manipulated for longer shelf-life. & there’s the pesticide issue. Moore: What about pesticides and supermarket fruits and vegetables? Entsminger: Well, you’ve heard of the Dirty Dozen? Moore: You mean the movie? Entsminger: Yes, and the produce. Researchers have determined that some fruits and vegetables contain more pesticide residues than others. Those are the Dirty Dozen. Here’s a list I saw recently: apples, celery, sweet bell peppers, peaches, strawberries, nectarines, grapes, spinach, lettuce, cucumbers, blueberries, and potatoes. Moore: Ouch. Those are some of my favorites! Entsminger: Mine too. But there are alternatives. You can buy organically produced fruits and vegetables or grow your own. 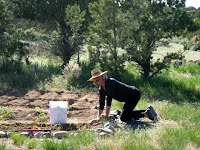 Moore: So you and Susan decided to avoid supermarket fruits and vegetables by starting a garden? Entsminger. Not exactly. Like everyone else, our diet would be quite restricted without supermarkets. But we’re trying to work around the inefficient mess of conventional farming and consumer dependence on whatever the conventional farmer and supermarket provides. An alternative is to grow the food yourself or buy locally. In most parts of the U.S., it’s still possible to grow a garden during the warmer months, and if you grow a garden, the logical follow-up is to preserve the food from your garden for winter. This was how my parents’ and grandparents’ generations went about it. There was no question of buying your winter fruits and vegetables in a supermarket since in my part of rural Virginia there were no supermarkets nearby until at least the 1950s. Moore: My godfather used to say that the U.S. ended in the 1950s, but perhaps it was earlier for people who wanted fresh foods! However, there is a growing trend toward sustainability and people making home gardens. 1. Grow what you can. 2. Buy locally when you can. 3. Preserve what you can from your garden or local sources. 5. Buy in supermarkets as a last resort. 6. Avoid growers using pesticides. Moore: How do you preserve food? Entsminger: We preserve by canning or sun-drying, and we store root vegetables (potatoes, beets, onions, garlic) in cool areas. Root cellars are ideal. Apples can also be stored all winter if kept in a cool place. My parents had a cellar where we kept a winter’s supply of apples, potatoes, and onions. We grew the potatoes and onions, and we bought the apples from a local orchard. Susan and I are also experimenting with other methods as well, but we rarely freeze produce because of the energy it requires to maintain a freezer. This too is a trade-off because frozen foods can retain a bit more of their nutrition. Part II of the interview with Gary Entsminger about Producing Your Own Food will be featured in a subsequent blog. 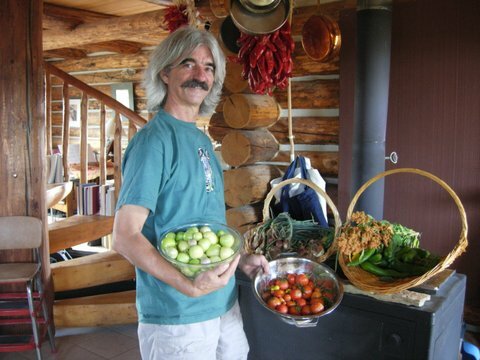 Great interview - I love to read Gary and Susan's tips and advice for growing and storing food. As well as the health and environmental benefits, it saves money too.